Our first step was to approach Brook. We’d identified that they had little online information about miscarriage and knew that for many young people Brook would be the first port of call when they needed help with pregnancy loss. Brook are redeveloping their website and resources so it made sense to work in partnership to share learning and ensure that young people were supported at every stage of their support-seeking journey. We kicked off our research with a workshop with Brook’s P+ participation group (and other young people from London who were interested in taking part). 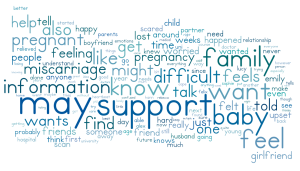 We developed personas of young people who had experienced miscarriage or ectopic pregnancy (or had partners who had) and discussed how they and their family and friends might be feeling, what information and support they might want and whether they might face any difficulties accessing this support. 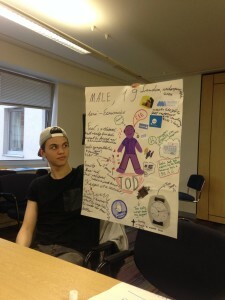 For a great blog on how personas can help develop services, take a look at this one on Innovation Labs. To help those people who didn’t feel very creative or needed some inspiration to get started, I gathered loads of collage materials and pictures that participants could use to illustrate their personas. One of my favourite bits of collaging was one of the participants who stuck a picture of toast on their persona to illustrate their persona’s feeling that ‘life goes on, we still have to make toast and eat’. After discussing our personas we used them as a basis from which to explore the Miscarriage Association and Brook websites. With their personas in mind, participants answered questions like ‘why would they use it?’, ‘why wouldn’t they use it?’, ‘how easy was it to find the info they might need’. As the participants explored the site, the other facilitator and I watched them do so, chatting to them about what they were doing and why. It was fantastic to meet and work with members of Brook’s P+ group and other London participants but we wanted to provide an opportunity for young people from all over the UK to get involved. I used Ning to create a private online workshop space. Signing in to this space meant that participants could discuss and share views safely, privately – and anonymously if they so wished. We set a three day time slot for the workshop to help it feel like more of an event. I find this also encourages everyone to take part at a similar time, something that was important if we wanted to encourage discussion among the participants. A similar consultation with Mind’s Elefriends community worked better for this approach. CALM, TheStudentRoom and YouthNet all kindly shared our advert. In the week before the workshop I opened the space initially to the P+ group and then to everyone involved (opening it up to a previously engaged group first helped to make it more populated, active and interesting when new participants signed up). New sign ups were encouraged to take a look around, introduce themselves if they wished and read through the ‘Looking after yourself’ section. Ning allows you to broadcast a message to everyone via email so I could send out some reminders as the workshop approached. During the course of the three day workshop I added two activities each morning. Participants could choose one or the other (although some people did both). We worked with personas again. This time we used Lego characters. Some of the characters had stories attached, while others only had names. One of the first activity options was to choose three of the characters, tell their story and answer some questions about their support. This provided a basis for the rest of the activities and enabled people to tell their stories without things getting too personal. Most people responded on the Ning platform but some chose the more private option of sending me their answers via email. Participants created a fantastic range of situations for the characters. One focused on the impact of cultural and religious differences, another on an experience of sexual abuse and miscarriage. Some were at school, some at university, work or college. Some were in relationships, some were single. Some had planned the pregnancy, others had not. All explored the support that the character might need and where they might get it. Participants were also given the opportunity to tell their own story – and a number chose to do so. In doing so, they helped create a space where others felt more comfortable, knowing they were among peers with similar experiences. 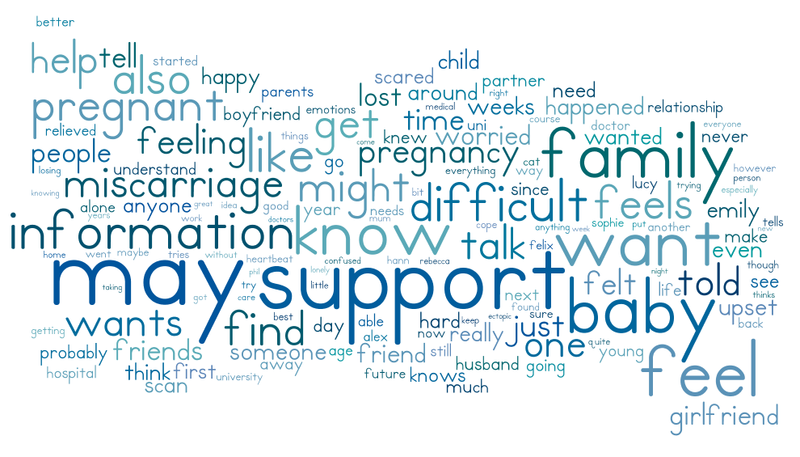 I’ve written about the role of personal stories in online support here. After completing an activity, participants’ profiles were updated to include a completion badge. Throughout the activities, I stayed on hand to respond to comments and ask additional questions as they came in. After Day 1, I created a Wordle of all the stories and comments to give some immediate visual feedback. Although not one of the set activities, one participant decided to create her own as a result and sent that to me too. 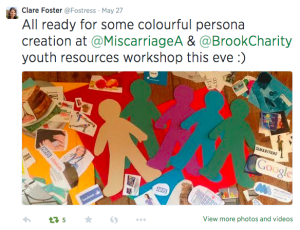 On Day 2 & 3 of the workshop, participants were asked to look at the Miscarriage Association’s current offering, go exploring online for examples of support they liked and think about what their personas might search for and what they might find. 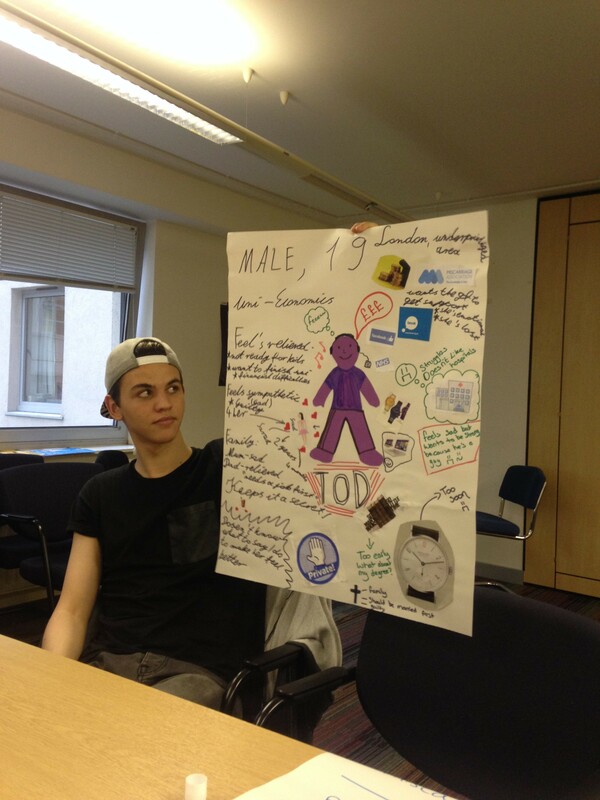 Although I tried to keep the activities short – taking 30 minutes at most – some participants chose to call up helplines and research organisations in much more depth to find out what was available and give us their opinions on it. We finished by asking people to look back over everything they’d done as a group and give us the top 5 things they felt the Miscarriage Association and Brook needed to think about. We’ve come away from this stage with 50 pages of experiences, thoughts and comments from young people, many of whom have experienced miscarriage themselves or know someone who has. We also have a number of participants who have volunteered to stay involved in the process. We’ll be taking a look at all the feedback, reading the stories, spreading out the collages and personas, amalgamating the top fives and then coming back to them with our ideas. We can use the Ning platform to see what they think of them and test things out as we go.